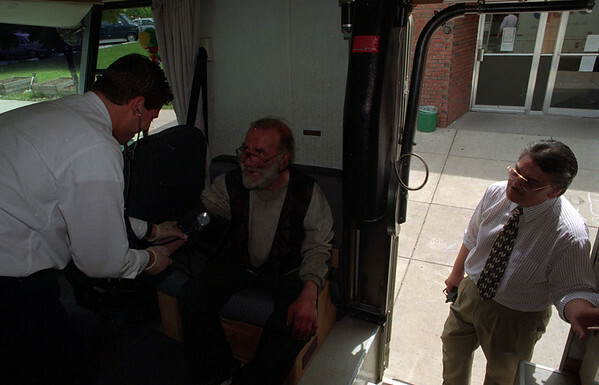 5/28/97--CATHOLIC WORKER/HEALTH--DAN CAPPELLAZZO PHOTO--SERVICE COOR. CHRISTOPHER KOCHAN TAKES THE BLOOD PRESSURE OF NF RESIDENT ARNOLD BROOKS, AS ADM. DIR. COMMUNTIY MENTAL HEALTH CARLOS REYER LOOKS IN TO THE MEMORIAL MEDICAL CENTER MOBLIE HEALTH UNIT PARKED IN FRONT OF THE CATHOLIC WORKER, ON NIAGARA STREET. THE UNIT CHECK OUT OVER 100 AREA POEPLE WEDNESDAY.